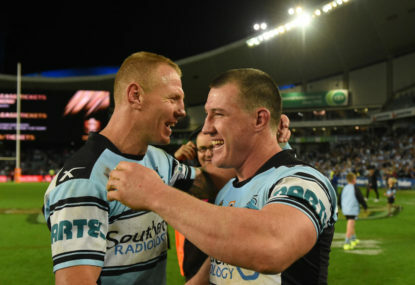 One of the longest and most versatile careers in rugby league will end in 2018 with veteran Cronulla star Luke Lewis to retire at the completion of the season. Lewis was a part of the Sharks’ 2016 NRL premiership team and also won a title in 2003 with his former club, Penrith. He also represented NSW at State of Origin level and played 16 Tests for Australia. Currently equal 18th on the alltime NRL games list with 315 matches, Lewis is expected to finish just outside the top ten by season’s end. But his longevity is just a part of the story. Across his NRL career he has started in all positions barring the front row and fullback and is thought to have covered those missing spots at some point during matches. Lewis told FoxSports that former Panther Brad Izzard had instilled a strong work ethic in him, something that would serve him well as he changed positions and clubs. “I remember as a young kid Brad Izzard came into the room and said to us, ‘You might think you’re the most talented player in this room, but I promise you the most talented won’t make it, the ones that will make it are the ones that are willing to work hard,” Lewis said. “I never made anything as a kid. I never made schoolboys or any sort of representative side but that was something pretty close to my heart what Brad said. “He said if you’re willing to be out training on Christmas Day and the bloke that’s coming up for your position is not you get that little bit of an edge over him and you might get an opportunity. Currently playing in the backrow with the Sharks, Lewis first came to prominence in 2002 with Penrith when he scored 17 tries in 23 matches in a breakout season. By the following season he’d won a grand final with the club, scored another 18 tries largely from the wing and was selected in the Kangaroos squad at the end of the season. He’d start a decade-plus run with NSW in State of Origin the next year, finishing with 17 state caps at the end of 2014. Lewis came close to joining South Sydney in 2008 but stayed with the Panthers before eventually linking up with current club Cronulla in 2013. He won the 2016 Clive Churchill medal as best on ground during the grand final.